I love winter squash, and they can be hard to grow here in central New Mexico because of our thriving population of squash borers. The vine grows beautifully and sets baby squash in a responsible fashion, then one day it wilts, then it dies. I have tried all the organic “remedies” listed in the books, and don’t think that any of them are worth my time, in that the vine may survive (barely) but the chance of a good crop is nil. So this year I tried to beat the borers genetically. 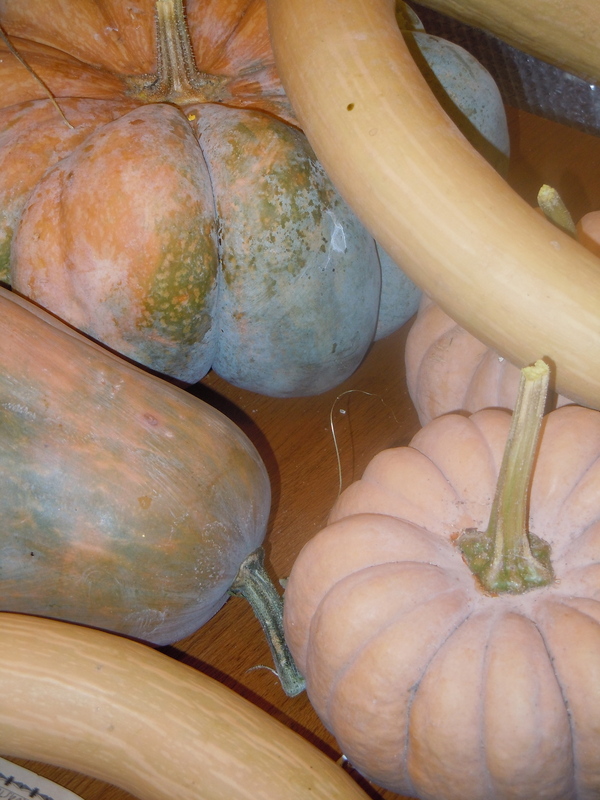 I grew only squash varieties of the species Cucurbita moschata, which is rumored to be borer-resistant. All I can say is, there are no guarantees in gardening, but I didn’t lose a single vine and my garage shelves are heaped with squash. To use this method, you have to find a catalog that identifies squash by species as well as varietal name. I got mine from Baker Creek Heirloom Seeds. They are a great source for interesting heirlooms. I chose five varieties: Waltham Butternut, Musquee de Provence, Kikuza, Chiriman, and Sucrine du berry. All bore fairly well, although the sucrine du berry were the clear winners in terms of total pounds of squash. So far, the Kikuza are the best in flavor and texture, but I’ve only tasted three of the five varieties so far. My favorite way to eat squash is halved,seeded, and roasted, with maple syrup or agave nectar and a pat of butter in the hollow. They will roast nicely at any temperature from 350 to 425 degrees, although of course they need more oven time at lower temps. Be sure to roast them long enough, by the way. The flesh should be soft and the syrup well sunken into the flesh. My preference in squash is a sweet dry flesh with no stringiness about it. To let any squash reach its best potential, it’s important to leave them on the vine as long as possible. Often the vines will die back in late fall, signaling harvest time, but if they don’t, harvest the evening that your first frost is predicted. It’s tempting to harvest them earlier when the skin hardens and they look mature, but this is the road to stringy watery flesh. Let the vine do its work. Once harvested, be careful not to bump or bruise them and set them on shelves in a cool place, not touching each other. I like to set several of mine on one end of my dining room table, where they look opulent and festive, but be sure to cook them within a month, since storage conditions in the average dining room are not ideal. The ones kept in a cooler (but not refrigerated) place will often keep well until January or February, but they do lose quality if kept too long. If you suspect that they are past their peak, roast them as described above and freeze the flesh. I see a lot of recipes for squash that involve steaming the flesh, but I would never bother with them steamed. Roasting brings out the lovely caramelly notes and gives a rich flavor. Whenever I have something baking that doesn’t fill up the whole oven, I roast a split squash in the remaining space, and since the halves keep well in the refrigerator and are even better warmed up a day or two later, I have a handy adjunct to a meal waiting. If you have chickens, don’t forget to give them the stuff you scooped out when preparing the squash. They relish the nutrient-rich seeds. I also give the scooped-out shells to the chickens after dinner, and they enjoy those too.